DD/EHSSB/NIEC Democratic Dialogue was established in 1995 to promote new thinking about Northern Ireland-political, economic, social and cultural. It has worked in a participatory mode, using round-tables, citizens' juries, focus groups and so on. It also organises lectures and seminars to further debate. It works in partnership with other organisations on projects, and seeks to secure not only publicity for the results but also policy impact. It is connected to a range of Irish, British and international policy networks. Details of its publications are appended to this report. The Eastern Health and Social Services Board is a non-departmental body assessing need and commissioning health and personal social services for 660,000 people, as well as monitoring services and assessing health outcomes and promoting health and social wellbeing. It has an annual budget of almost £500 million. The board has developed expertise in resource allocation and prioritisation of service development, to ensure resources are equitably distributed. Redistribution can be contentious and has required the board to develop objective approaches which it can share with the public and its representatives. is an advisory body set up by the secretary of state in 1977. It is a successful example of consensual social partnership, comprising representatives of business, trade unions and independents. It has a wide remit to provide independent advice to the secretary of state on economic policy for Northern Ireland. It generates three series of publications: reports, occasional papers and research monographs. A list of the more recent is appended. In addition, the council holds seminars and conferences, often in partnership with other organisations, to promote debate. This report is the product of a unique partnership between the think tank Democratic Dialogue, the Eastern Health and Social Services Board and the Northern Ireland Economic Council. The three organisations came together behind this project because they were concerned to see a sharper focus on the very real dilemmas issues involving public expenditure will pose for elected representatives in Northern Ireland, as and when devolution takes effect. 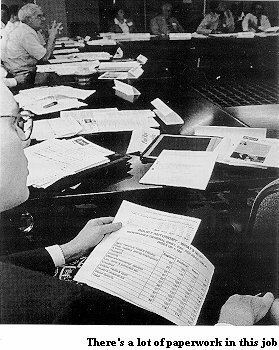 DD was established in 1995 partly out of concern that economic and social issues were not sufficiently debated to prepare politicians for the intense pressures of government. For its part, the EHSSB has, of necessity, daily to confront how it sets priorities within limited budgets. And the NIEC has a record of interest in the implications for the region of 'decentralised governance' (see appended publications). The views expressed by the contributors are, of course, their own. But all three organisations would strongly welcome opportunities to continue this debate in other public formats. Details of each can be found on the inside front cover of this publication. Northern Ireland is on the cusp of a new era. If the post-agreement impasse over paramilitary weapons decommissioning can be broken, a wholly new climate for its elected representatives and civic leaders hoves into view. In this complex new political architecture, the most significant element will be the replacement of the paternalism of 'direct rule' from Westminster by the democratic Assembly at Stormont and its Executive Committee. Yet the exercise of autonomy in the modern world means something quite other than what it meant in 1972 (see John Loughlin's chapter). The post-war period has seen the progression of three paradigms of the state: the expansive welfare state (1945ff), the contracting neo-liberal state (1979W and what might be called the communitarian/social state. This last, emergent model, characteristic of Blairism, sustains neither the command-and-control approach of the welfare estate nor the leave-all-to-the-market stance of the neo-liberals. It is an enabling state, in which the pursuit of equality of opportunity and social justice is no longer counterposed to an environment favouring competition and excellence. The new paradigm is characterised by slimmed-down bureaucracy, with devolution of power to regions and revitalised local government, and much 'governance, - the business of government-taking place through networks that include civil society. Thus while the new Assembly chimes with international trends, its politicians will find the exercise of government by no means the pulling of the relatively simple levers of a quarter century ago. Moreover, what precise autonomy they will have is moot: as the UK is not a federal state with a written constitution, Westminster overrides may still come into play-or there may be arguments as to whether they should - especially in the field of external 'para-diplomacy'. The task is to find the right level of autonomy in addressing the challenges of globalisation and competition. There has been growing pressure upon the public purse in recent decades, in particular with an ageing population and increasing social insecurity (see Vani Borooah's chapter). But if this has led to public-expenditure cuts and privatisation internationally, there remains a case for government intervention in the economy - the problem of market failure. Indeed, the old debate around how much governmental intervention has become a debate about its quality. For example, government needs to underwrite general, non-firm-specific training to overcome the fears of firms that any investment in training would be recouped by others through poaching of trained workers. Market failure in Northern Ireland is reflected above all in the failure of the labour market to clear. Unemployment, though recently reduced and no longer the highest in the UK, remains high-especially long-term unemployment-and is surrounded by a much larger penumbra of social exclusion, exacerbated by recent trends widening inequalities between individuals and households. Social inclusion is the priority area for public expenditure and policy-making. Since 1978, Northern Ireland's public-expenditure allocation-like that of Scotland and Wales-has been determined by the so-called Barnett formula, whereby increases in comparable programmes in Great Britain are matched in the region according to a population-based ratio (see the chapter by Barnett and Hutchinson). Yet the formula has yet to be applied in the context of decentralised government for which it was devised, owing to the collapse of the then Labour administration's devolution plans. But devolution implies choice over priorities-not simply following central-government programmes. This in turn implies a need for marginal tax-varying powers-as in the Scotland but not the Northern Ireland bill - so that the regional administration is to some extent accountable for its decisions. If retained, the 'parity principle' - applied to social security, UK-wide salaries for public servants, agriculture, health, education and housing-will, however, greatly restrict the apparently large discretion in public-expenditure allocation devolution the Northern Ireland Assembly will enjoy. Yet the Assembly can, and should, set itself ambitious policy targets, particularly in economic development and the quality of public decision-making. If this will pose challenges for regional politicians, used to decades in opposition, all-round UK devolution will also challenge the notion that Westminster parties campaign on UK-wide manifestoes. Central government will have to learn to 'let go'. The dynamics of the Barnett formula and the detail of public-expenditure accounting for the territories are very complicated (see David Heald's chapter). But the increased visibility of fiscal transfers to Northern Ireland, Scotland and Wales is likely to bring pressure for reduction of the differential support they enjoy. The best response by the devolved bodies is to embrace transparency and support a comprehensive needs assessment and an Australian-style Territorial Exchequer Board. Within Northern Ireland, better value for money should be sought via a review of the machinery of government, including, for example, the administrative arrangements for health, social services and education. Special Treasury support will be required for the up-front redundancy costs of reduced 'law and order' provision, which may mean later savings returning to the Treasury rather than being transferred to other programmes. Greater openness in public-expenditure decision-making should be established, with the Department of Finance and Personnel required to present costed options to Assembly committees. Confusing official public-expenditure documentation should be rationalised and each of the major Assembly parties needs to designate someone who can master the specialist expertise required to engage with the civil servants involved. The Barnett formula institutionalised Northern Ireland's relatively favourable public-expenditure treatment. This is likely to be increasingly questioned, and some new method for allocating expenditure across the UK devised. For reasons of both accountability and efficiency, the Assembly should be given tax-varying powers. A regional income tax would be the best mechanism. Northern Ireland's political culture remains largely set in the climate of the expansive welfare state'. This encourages unrealistic expectations about the degree to which the state can solve the region's social and economic problems. The involuntary coalition which is to be the Executive Committee and the dispersal of power in the new dispensation, allied to the continued dominance of the UK system of governance, will mean change will be initially slow. Given the cold climate for public expenditure, the quality of public-policy decisions, priority-setting and value for money come to the fore. Growth with development should be the goal of the new administration. As well as great opportunities, in the wake of the Belfast agreement Northern Ireland faces unprecedented challenges. Perhaps the most important has been least discussed: how to ensure policy autonomy is used creatively to bring tangible change to a war-weary population with otherwise largely the same aspirations for themselves and their families as anywhere else; how also to set priorities such that expectations are realistic and can be effectively met. It was to this end that the three partners in this project jointly organised a round-table in Belfast in June, courtesy of the Eastern Health and Social Services Board, on the theme of policy autonomy and priority-setting. This publication is the result, though hopefully only the beginning of a much larger debate which, while technically difficult - in as much as it touches on complex issues of public expenditure and budgeting-is far too important to be left, in effect, to a coterie of civil servants. And this introduction seeks to give just a flavour of the range of stimulating contributions made around the table that day. As one senior politician has put it, Northern Ireland has developed a political culture of 'protest and demand'. Richard Barnett and Graeme Hutchinson see this as attuned to decades of permanent opposition under direct rule but wholly inappropriate to the new context where almost all parties are moving from opposition to government. That means a Gestalt shift from the conservatism of saying no to unacceptable government plans to articulating positive policy alternatives, from the luxury of demanding new expenditure as a solution to every problem to the hard choices of working within fixed budgets, from the introversion of a 'provincial' politics to the outward-looking learning required in a fast-changing policy environment. The biggest danger facing the Belfast agreement-apart, of course, from its collapse-is the mundane threat of bad government. Bear in mind that the agreement prevents citizens exercising what could be seen as the ultimate democratic right: to 'turf the scoundrels out'. Thus in Belgium, with its similar power-sharing arrangements, the same cast of characters has reappeared in government after successive elections - contributing to the alienation evident on the ground. One potential source of such cynicism could be continued attrition in government by unionists and nationalists - including over whether policy might or might not depart substantially from that prevalent in Great Britain, as a senior government official warned the round-table in June. Hitherto, the 'parity principle', while ensuring welcome support via the Westminster subvention for service quality and public-sector employment, has militated against innovation except at the margin (for example, the ineffective 'targeting social need' and 'policy appraisal and fair treatment' initiatives). As Sir George Quigley, outgoing chair of the Northern Ireland Economic Council, put it, parity was 'the God' under the old Stormont arrangements. He argued that the Assembly and Executive Committee should start with 'zero-based policy formation', as if (though there clearly are constraints) the region was independent. This, he suggested, could be an exciting 'joint venture' for the two main religious communities, conducted on an equal basis and with the Civic Forum acting as a 'fertiliser' of ideas. Take health, for instance. For too long, the EHSSB chair, Dan Thompson, said, debates about health policy and public expenditure had focused on high-technology projects (dear to powerful professional lobbies) and shroud-waving (resisting change in acute provision). This had militated against securing adequate investment in population-based prevention programmes and care for the vulnerable, chronically ill and disabled. Meanwhile, the health differentials between the wealthy and poor continued to widen- as illustrated by an emerging epidemic of suicide in young men, associated with unemployment and hopelessness. Mr Thompson suggested the solution lay not in building more institutions but in working with communities to help them articulate their problems and develop services and local solutions. He commended the architects of the Belfast agreement and welcomed the opportunity offered by the new arrangements to put in place equitable, accessible and high-quality services, tailored towards eliminating poverty and social exclusion and achieving measurable improvements in health and social well-being in the region. He called for the designation of a minister of public health, to ensure wider public-health issues had cross-departmental prominence in the Assembly. The Assembly and Executive Committee, as Barnett and Hutchinson argue, must set ambitious policy targets-particularly, as Vani Borooah indicates, in the achievement of sustainable economic development and social inclusion. These represent far more holistic approaches than the narrow reductions to the firm in the first instance and 'targeting social need' in the second have conventionally recognised. For example, there has been far too little public discussion-in terms of both objectives-of policy on education and training in Northern Ireland and the inadequacy of current arrangements to deliver a workforce that can enjoy a high-wage/high-productivity economy Moreover, these two policy goals would be mutually reinforcing, whereas currently TSN is largely seen as at best marginal to, or at worst a drag upon, the 'real' business of economic development. These concerns raise the wider question of the nature of governance, as John Loughlin stresses. In a changing architecture of levels of government throughout the European Union, the role of government is itself changing-away from a one-club approach relying entirely on financial levers of executive power (like assistance to firms or TSN) towards a much more sophisticated co-ordinating function among a range of governmental and non-governmental agencies and actors, in which the role of networks is key. In that sense, the problems of Northern Ireland are more profound than those of market failure found more generally They fundamentally stem from the cancer of sectarianism which has seeped through the tissues of the body politic, corroding trust and encouraging go-it-alone behaviour amongst individuals and groups-thereby crucially preventing the emergence of the common 'culture of commitment' so characteristic of the more successful European regions from which Northern Ireland must learn. It is in this context that the hitherto ill-defined role of the Civic Forum can be understood. If originally intended by its sponsors in the Stormont talks, the Women's Coalition, as a second chamber, the agreement gives it only an advisory role. But as such, the key business, trade-union and voluntary-sector components of the forum can do much to develop a simulacrum of social partnership within it, spurring government's developmental efforts and helping to deliver outcomes on the ground. A key function of the Assembly will be, as David Heald argues, to fill the 'democratic deficit' in Northern Ireland in exposing civil servants to scrutiny before its committees. This will require not only adequate professional assistance to the committees but also, as Heald emphasises, the accumulation of specialist knowledge by party groups and designated spokesperspons. One thing is, however, clear: Northern Ireland is not going to receive any further public expenditure largesse. It has historically enjoyed much higher per capita spending than any other part of the UK, it has had the benefit of the chancellor's special £315 million package in May and it has done well out of Labour's Comprehensive Spending Review because of the weight of the education and health sectors in the Northern Ireland block. It may (and should) be able to transfer resources from a diminishing 'law-and-order' budget to economic and social programmes, but the former remains 'reserved' to Westminster whereas the latter will be transferred to the Assembly, and the short-run costs (notably redundancy payments) of 'downsizing' the Royal Ulster Constabulary will be severe. Meanwhile, European Union support can only be expected to go down over time. Thus, as Heald argues, rather than engage in 'clientelistic whingeing' about the volume of external funding, managing expenditure better should be the focus (which happens, inter alia, to be the best guarantor that external support will be sustained). It is a task made considerably easier if there are clear policy-priority lodestars to follow; the indiscriminate search for efficiency savings, by comparison, has long suffered from the law of diminishing returns. But it remains tremendously difficult to divert monies from mainstream programmes. It is therefore also crucial, especially to achieve policy renewal, that relatively small amounts can be found to support innovative projects, trying out new policy approaches and feeding back experiment into the system. This is particularly true of the social-inclusion arena. Hence the case - apart from the claim of accountability - for some relationship between revenue and expenditure via tax-varying powers for the Assembly, as various contributors to the round-table strongly contended and-to their credit-the Alliance Party and the Social Democratic and Labour Party have both subscribed. As Sir George concluded the discussion at the round-table, beginning from identified objectives a 'shared vision' was required-a vision of Northern Ireland as a competitive region, marrying economic growth with social justice, private prosperity with good public services. Northern Ireland could develop policy, post-agreement, in a variety of external contexts, and the short-term task was to agree a programme for government. Employers, unions and the voluntary sector needed to become 'contractually committed' to clear goals. Last but not least, he said the responsibility of political leadership was a big one. But given the scope for dispute in these matters, as the government official said in June, over all this hangs the imperative that the first and deputy first minister, and the Executive Committee, provide the 'glue' to hold the whole project together. "If we don't get that right early on," he warned then, "I suspect we are in for some very choppy waters." 4 See 'The Civic Forum: a proposal to the first and deputy first ministers designate', New Agenda, Belfast, 1998. 5 See the chapter by Barnett and Hutchinson in this volume. 7 See also the moral argument advanced by Paul Teague and Robin Wilson in 'Towards an inclusive society', in Social Exclusion, Social Inclusion, DD report 2, Belfast, 1995.